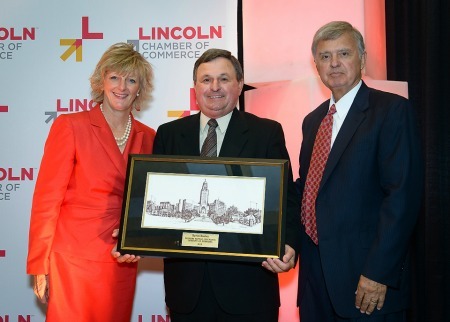 The Celebrate Business Awards recognized Mr. Boslau's involvement in improving the Lincoln community through construction projects. "Byron Boslau, president, CEO and chairman of the board of Farmers Mutual, was given the Roger T. Larson Community Builder Award. Boslau started at Farmers Mutual in 1974 as accounting manager and worked his way through the ranks to be named president and CEO in 1998 and chairman of the board in 1999. Boslau's community involvement has included being a member of the U.S. Bank advisory board and Special Olympics of Nebraska board, and serving as past president of the YMCA and as co-chairman for numerous capital campaigns for the organization. He also has won numerous awards, including the 2006 Public Service Award from the Nebraska Society of CPAs, the 2007 Champion of Greatness Award from Special Olympics, and the University of Nebraska College of Business Administration Business Leadership Award in 2010."